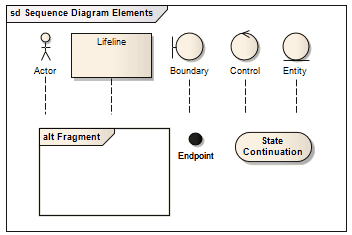 This example shows some possible elements of Sequence diagrams and their stereotyped display. An instance of an actor at runtime; this can be depicted either as the human figure or in rectangle notation. An Object element with the stereotype Lifeline. Represents a user interface screen or input/output device. A persistent element - typically implemented as a database table or element. The active component that controls what work gets done, when and how.